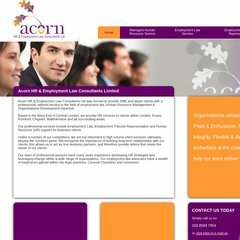 acornemploymentlaw.co... Employment Law Services - Employment Contracts - Employment and ..
Its 2 nameservers are ns2.willowviewwebsites.net, and ns1.willowviewwebsites.net. It is written for PHP/5.2.17 language. It is hosted by Keith Cassidy Ip Range 2 (England, Warwickshire,) using Apache/2 web server. PING www. (78.110.160.10) 56(84) bytes of data. A ping to the server is timed at 135 ms.